They call them “Devilishly Delightful”, but I’m not convinced. Something feels wrong with these decorations. 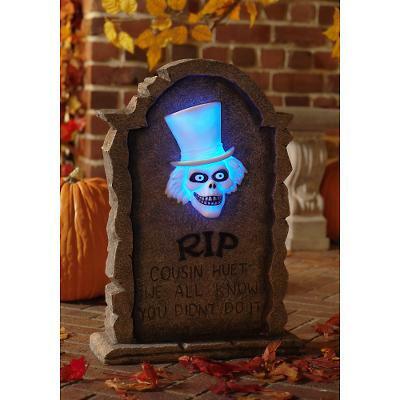 They look like the Haunted Mansion characters and the tombstone even sounds like the tombstones in the graveyard. I just can’t put my finger on it. Is it because they light up? Is it because they are photographed in bright light? I don’t know. Maybe it’s because I want the Haunted Mansion characters to stay in the Haunted Mansion. If they are in everyone’s front yard, they’re just rogue ghosts instead of the 999 happy haunts.